Tattoo Prodigies just came in and I am really excited to share it with everyone, after over a year and a half of working on it, planning, collecting work, interviews, and configuring it all together, It is finally complete, printed, bound and ready for you to enjoy. It's way more than I expected, and for those that have seen it so far, have been amazed by it! 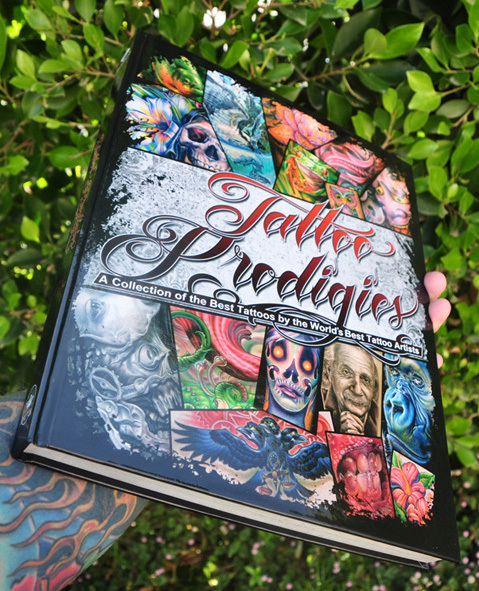 This hard bound coffee table book is 10 inches wide by 13 inches tall, with 256 full color pages with more than 800 pictures of tattooing and painting accomplishments, inspiring stories and interviews throughout. I have learned so much in the whole process of putting it together, im excited to be able to share it with everyone who can appreciate tattooing at it's best! It's now available through my website MDTattoos.com and at my shop MD Tattoo Studio in Northridge California, I'll also be bringing copies of it with me to the tattoo conventions, the next one is the Hell City Tattoo Festival in May. The guys at Hell City also offered to have the Prodigies book release there,so that should be awesome! I am honored to recognize the works of Nick Baxter, Guy Aitchison, Jesse Smith, Tony Ciavarro, Mike DeVries, Bob Tyrrell, Victor Portugal, Kore Flatmo, Jess Yen, Cory Kruger, Nikko Hurtado, Robert Hernandez, Deano Cook, Shane O Neill, Stephane Chaudesaigues, Shige, Robert Atkinson, Sean Herman, Josh Woods, Gunnar, James Kern, Boris, Durb Morrison, Carson Hill, Roman, Paul Booth, Adrian Dominic, Jeff Ensminger, Don McDonald, Tim Kern, Steve Morris, Michele Wortman, Bez, Franco Vescovi, Kari Barba, Alex De Pase, Paul Acker, Bugs, Craig Driscoll, Steve Moore, Steve Soto, Robert Pho, Monte, Jeff Johnson, Kyle Cotterman, Mario Rosenau, Ben Grillo, Toxyc, Liorcifer, Nate Beavers, Aric Taylor, Sweet Laraine, Joshua Carlton, Ron Meyers, Carlos Torres, Big Gus, Juan Gonzalez, Cory Cudney, Dan Henk, Nate Banuelos, Jeremiah Barba, Larry Brogan, Brian Brenner, Megan Hoogland, Tim Harris, Justin Weatherholtz, Mike Rubendall, Aaron Bell, Benjamin Moss, Ryan Hadley, Carlos Rojas, Tommy Montoya, Julio Rodriguez, Jay Wheeler, Juan Salgado, Mike Parsons, Russ Abbott, Cory Norris, Josh Duffy, Fishero, Andy Engel, Mike DeMasi, Mike Cole. Thank you so much for being a part of it!